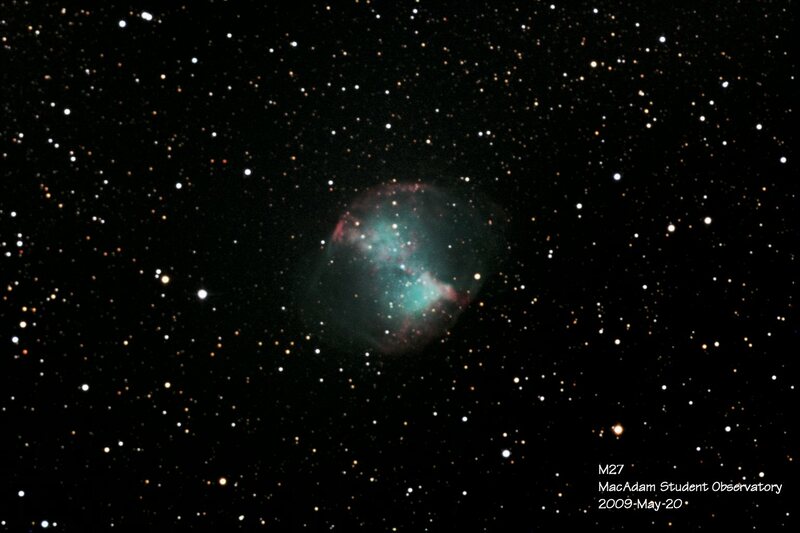 Messier 27, a.k.a. The Dumbbell Nebula is a showpiece planetary nebula 1,300 light-years distant. The distance was measured in 2009 by astronomers using the Fine Guidance Sensors on the Hubble Space Telescope. Knowing its distance and its apparent diameter on the sky provides the real diameter of the brightest parts of the nebula: 2.3 light-years. Very deep images of M27 show that the central star responsible for the nebula, has episodically puffed off layers of gas in the past. The red light is produced by ionized hydrogen; the green light is produced by oxygen that has lost two of its electrons. This star is returning heavy elements back to the interstellar medium, making them available for new stars and planets. The Ring Nebula: Faintly visible during summer months in modest telescopes from dark sites, it is a sun-like star nearing the end of life. 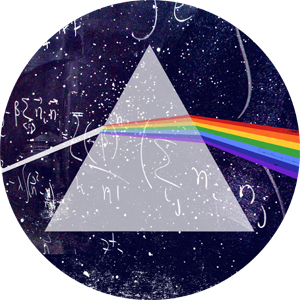 Hydrogen fuels the stars, and that fuel must someday run out. Having run out of hydrogen in its core, the star at the center of this colorful and expanding cloud of gas is fusing the nuclear ashes from its last few billion years (helium) into carbon. Fusing helium offers less energy than hydrogen burning, so it can do this for a time that is only 10% of the time that it previously fused hydrogen into helium. This is the fate of the Sun in another 5,000 million years. These nebulae are called planetary nebulae. Because of their generally round appearance they reminded astronomers of faint copies of planets. The term is misleading, but is well established in the literature after 200 years of use. 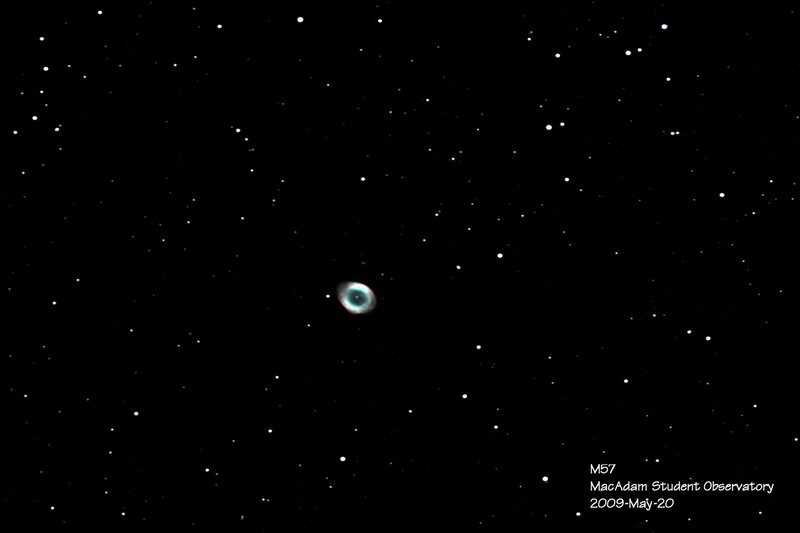 M97, The Owl Nebula was discovered by Méchain in 1781, just below the bowl of the Big Dipper. Another example of a planetary nebula, there is an obvious central star that provides the high energy radiation that makes the gas glow. Interestingly, when the 3rd Earl of Rosse at Birr Castle, Ireland, pointed the largest telescope in the world at the Owl, hesaw a star in both of the “eye sockets.” Did he simply misplace one of the stars we see today in his drawing? William Parsons was a careful observer and the first to see the spiral shapes of some brighter galaxies. We may never know. There is a faint halo of expanding gas (not seen in this image) that was ejected by the star more than 40,000 years ago. The shell visible in this image is less than 10,000 years old. At the adopted distance of the Owl, the visible shell is a little more than one light-year in diameter. 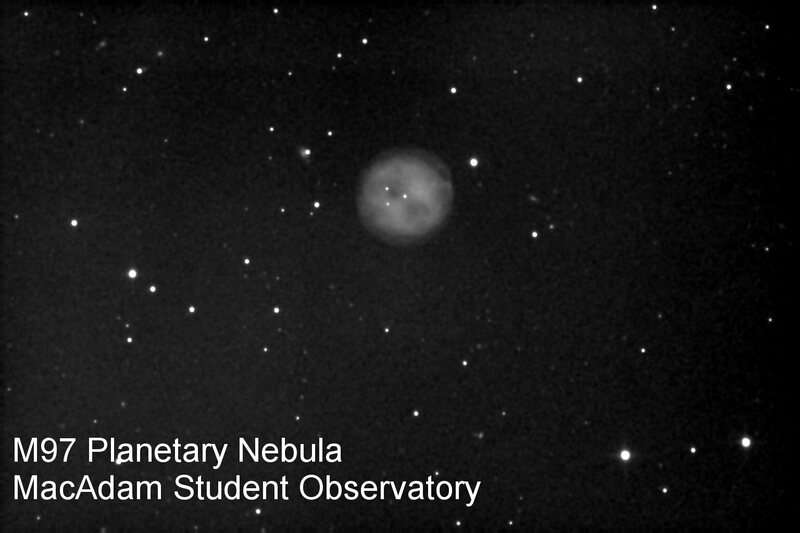 Alas, the distances to planetary nebulae are generally known to a poor accuracy. 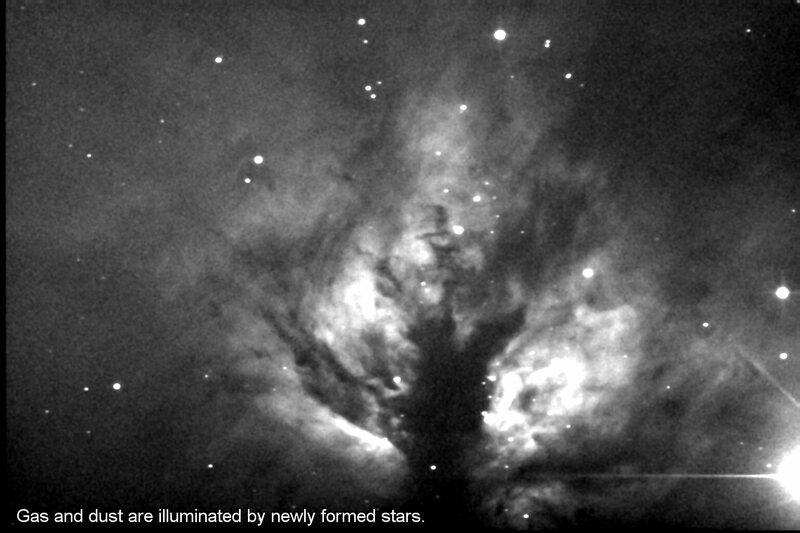 NGC 2024, The Flame Nebula is part of the same gas and dust complex that hosts the Horsehead Nebula. The bright flare in this image comes from the easternmost star in Orion’s Belt. Behind the dark silhouette of gas and dust, new stars are forming. These young, hot stars cause the gas to glow. At the same time these new stars heat the cloud, causing it to expand, turning off the star formation process. Star formation is an inefficient process; only a few percent of the mass of the cloud will go into star formation, insuring the life of the Milky Way Galaxy will extend into the distant future. 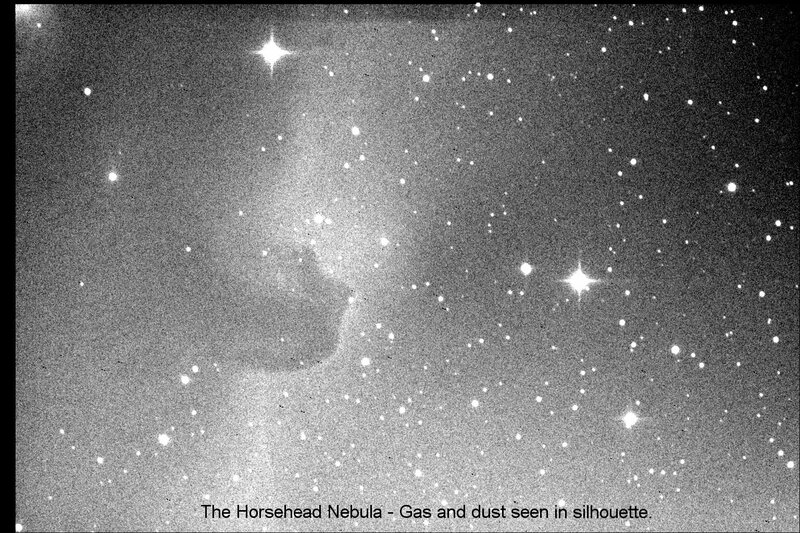 The Horsehead Nebula: Named for its obvious resemblance to a Bluegrass Thoroughbred, The Horsehead is a dark cloud of gas and dust seen in silhouette against a fluorescent cloud of hydrogen. It is notoriously difficult to see visually but is much easier to photograph. Though hard to see, it’s not hard to find: 30 arc-minutes (one full-moon-width) south of the easternmost star in Orion’s belt, Zeta Orionis or Alnitak.